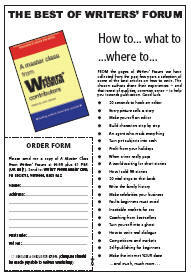 FROM the pages of Writers’ Forum we have collected from the past few years a selection of some of the best articles on how to write. The chosen authors share their experiences – and that rarest of qualities, common sense – to help you towards publication. ... and much, much more. . . Hype has become to publishing what global warming is to the polar icecap.